While color, smell, and ingredients are similar on both of these lotions, the consistency of the up&up version is wet and sticky. We recommend you stick with the Jergens on this one! At first glance these lotions appear the same, but we could not get over the sticky feel of the up&up version. With winter drawing near and temperatures dropping, lotions will become a necessity for us. It was time to stock up at HQ, and we liked the sound of lotion for "extra dry" skin. The packaging and color of these lotions is similar, so we feel they will both do the trick for soothing dry skin. 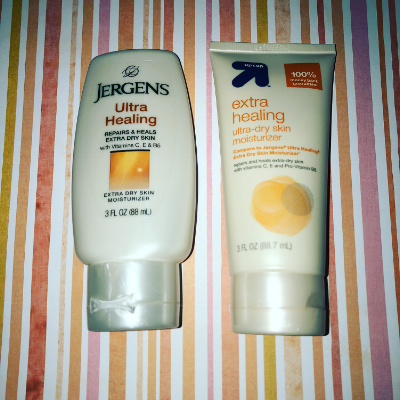 After taking a whiff, both lotions are fairly scent-free, but we did feel the Jergens lotion had a slightly milder smell. As for the consistency and after-feel, this is where the lotions differ the most. The Jergens version is creamier and has a nice smooth feel to it. The up&up version is wetter and feels sticky after use. This is a deal-breaker for us, and we will be sticking with Jergens!